At any rate, when this string is played, there's a terrible fret buzz right where the string is deformed. It is possible for a string to have been damaged over more than one fret, but that's an even more rare ocurrance. At any rate, stick on a new string, and the problem goes away. Often, you can see the bent string, but sometimes the deformation is quite subtle. 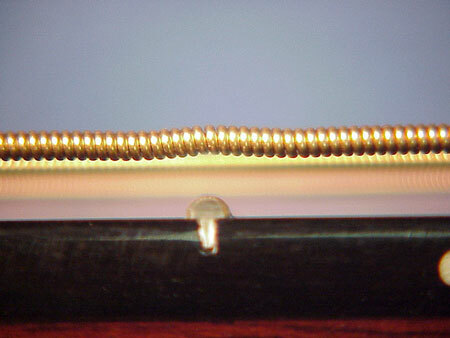 Suffice it to say, this is yet another reason to use new, good strings when diagnosing the mystery buzz.